Nine of Wyoming's 12 state parks are based around an artificial lake, and so are popular for boating, fishing, swimming, water skiing and camping by the water; they all have similar scenery of low treeless hills with occasional rocky outcrops, enclosing the narrow, branched reservoir. Boysen State Park is a typical location, and contains the 19,000 acre Boysen Reservoir, created in 1952 by an earthen dam along the Wind River near the center of the state, between Thermopolis and Riverton. The park is reached by US 20 which runs close to the eastern shore, passing campsites, picnic areas and shoreline access points, and another road leads to part of the southwest shore; here are several more primitive camping areas and a boat launch facility. The most scenic part is in the northwest, where the lake is bordered by an area of multicolored badlands with eroded rock formations, however this is a long way from any paved road. Cross-country hiking is quite possible and the park has a few maintained trails, though this is a place aimed primarily at recreation on the water, and doesn't offer much for the casual passer-by. The main activity is fishing, especially for walleye, perch and rainbow trout. 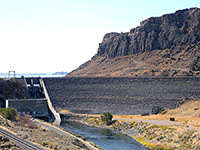 Boysen Dam was constructed across the Wind River just before it enters a deep ravine (Wind River Canyon) through the Owl Creek Mountains, which extend upstream for ten miles towards Thermopolis, and reach heights of 2,500 feet above the valley floor. The gorge starts gradually just south of town, narrow and sheer-sided at first but quickly deepening, as the initial sheer layer becomes high above, below which the sides are steeply sloping, covered with grass and bushes. The rocks are ancient sedimentary layers from the Triassic and Precambrian eras, muted grey-brown in color. There are plenty of pull outs along the road for views of the cliffs and the Wind River, as it flows through a thin corridor of tall cottonwood trees. 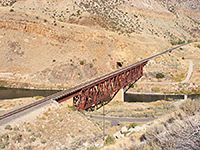 A railway parallels the highway on the opposite bank of the river, crossing over just before the dam, and then running right along the east shore of the lake. 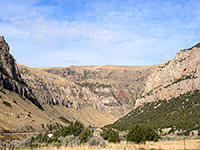 The land surrounding the reservoir, at the foot of the mountains, is typical of much of central Wyoming - low mesas, short cliffs and flat plains, covered by sagebrush and short yellowish grass. A few isolated buttes now form tiny islands in the lake, which has flooded 20 miles of the river, though the south end is very shallow, and the length can vary significantly depending on the water level. The northeast shore of Boysen Reservoir has a marina, ranger station, the state park headquarters and three campsites (Brannon, Tamarask and Tough Creek); this latter is the most scenic, situated on a narrow peninsula. South of here US 20 moves away from the lake into the small town of Shoshoni where US 26 forks west, re-enters the state park and crosses the south end of the reservoir on a causeway. The lesser-used route (Bass Lake Road) to the west side campgrounds - all small and offering limited facilities - branches off soon after, linking with other tracks that wind along the waters edge as far as Cottonwood Creek, a large tributary that puts an end to easy travel further north. The state park charges a day use fee of $6 for the parking areas close to the water, while camping costs $17 per night. South of the lake, US 20 continues alongside the Wind River towards Riverton, across land of the Wind River Indian Reservation.